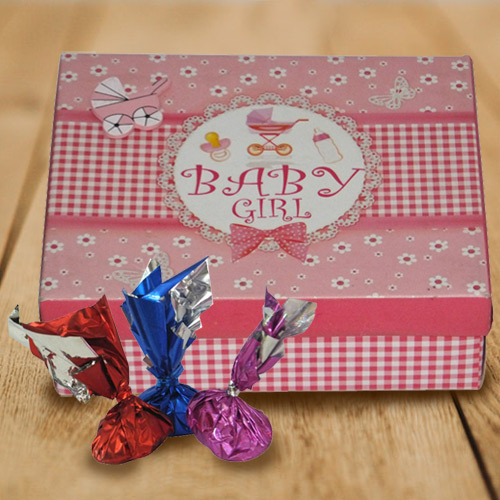 Celebration special wishes are best delivered by gifting this Magical Baby Girl Homemade Chocolate Gift Pack to your family and friends. This Gift pack contains 15Pcs Assorted Chocolates and 5Pcs Lollypops. Flowers Delivery Secundrabad, Send sweets Mangalore, Wedding Cake Gorakhpur, Diwali Mithai Jhunjhunu, Send Flowers and Gifts to Baroda, Online Shop Tirupur, Flower to Sirohi, New Year Flowers Kodaikanal , Fresh Fruits Bhilwara, Send Gift Shimoga, Dry Fruits to Thiruvanthapuram, Birthday Delivery Purnia, Sending to Bangalore, Flower shop Nawashahar, Jalandhar Online Cake Delivery.